Introduction to the light box! Today’s post is an introduction to the light box! Have you seen these ideas floating around the web? I thought it would be an easy multi-sensory way to engage the preschool speech and language population! I started by making a light box . I already had everything I needed except a plastic container so it was cheap! I used the tutorial HERE at Testy yet Trying. My light box turned out great! This week I used it with some preschool friends. They are working on the /k/ sound. We are still working on auditory discrimination between /k/ and /t/ so we got out the box of translucent letters and searched for the K’s and T’s. We worked on saying /k/ and /t/ in isolation. 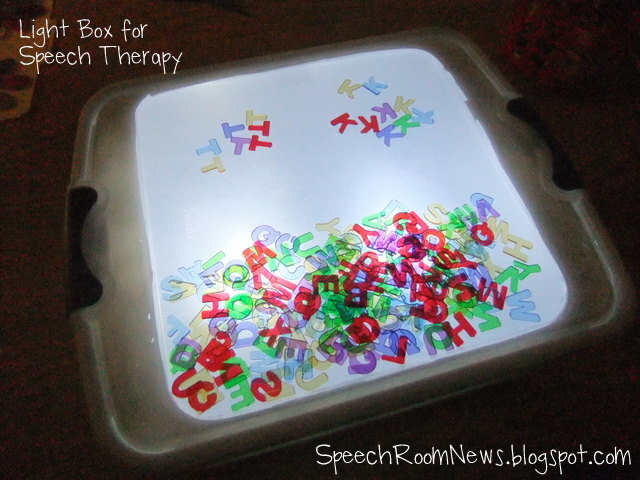 It was a fun activity to start using the light box! I’m sure you’ll be seeing more activities using it soon! Where did you get the letters?